Get familiar with the major elements before drawing a workflow diagram. Use an unbeatable automatic diagram software to diagram workflow vividly. 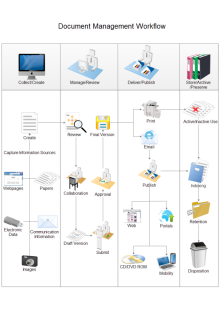 Make a workflow diagram like no other quickly. Workflows are a series of actions that correspond to a work process, such as an e-document approval process and human resources workflow. These actions include both actions performed by people and actions carried out by the workflow. Generally, workflows include these major elements: events, actions, conditions and steps. Each workflow is initiated by an event, followed by a series of steps. Each step consists of actions and any associated conditions such as the person who is responsible for execution at each stage, which documents are associated with the task and identified resources that are required for implementation. An event starts or initiates a workflow. Events can also manage the timing of actions within a workflow, such as waiting for the status of an item to change. 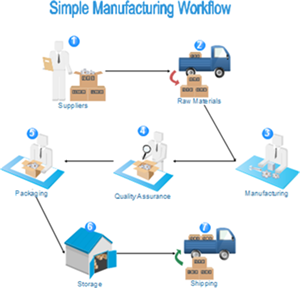 Workflows can start manually or automatically by workflow management system. A workflow can contain any number of actions. Actions can be performed by the workflow or executed by workflow participants. For example, in a document approval workflow, the act of actually reviewing and approving the document is typically done by a manager. 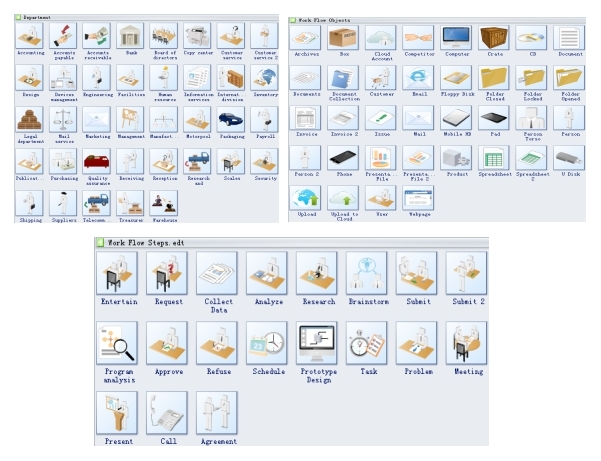 A certain action done by a workflow participant is represented by a symbol of the tool of the illustration of that person. See Edraw's useful and unique workflow chart shapes. These are rules that apply conditional logic to actions. Establishes a condition where the workflow performs the associated action only if that condition is true. Show what the next step is, if the condition is not true. For example, you can create a rule where the workflow copies a document and sends a reviewer an e-mail if an item is approved. A workflow contains one or more steps. Each step can include various amounts of actions and associated conditions. Steps allow you to group conditions and actions so that one set of rules (conditions and actions) can be evaluated and performed before a second set. In Edraw, you can even use Cross-functional shapes to divide steps into different groups according to their features, just like the example below. Nothing can beat an automatic diagram maker which embeds 6000+ vector shapes, auto generation function and numerous templates and examples. 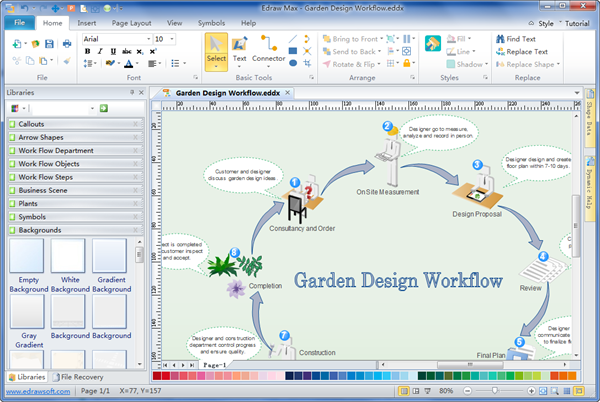 With it, most people can make a professional-looking and creative diagram like no other in the fastest way. Since the user interface is quite similar with MS programs and no drawing experience is required. Check it out below. Discover why Edraw is an excellent program to create garden floor plan. Try Edraw FREE.